The Hall keys will be available from the Clerk or a designated substitute. At the end of the hire and after securing the Hall, they must be returned immediately. Please ensure that any outside caterers, contractors and bar staff are aware of the hire period and that they should not occupy the premises outside of these times, having regard to the paragraph below. Guests are expected to vacate the premises within fifteen minutes of the end of an authorised licensed activity. After this period only those helping to clear up the Hall should be on the premises. Failure to comply with this will result in forfeiture of your special deposit and may result in us losing our Premises Licence. The ‘Main Hall’ is approximately 7.8m (25.5ft) wide x 17.5m (57.5ft) long . The ceiling at full height is 3.38m for the full length of the hall for a central width of 3.60m with the ceiling tapering passed this point, each side, to 2.7m high. There is an alcove, normally used to store the tables and chairs, of 5.4m (17.8ft) wide x 3.38m (11ft) deep. The raised stage is 7.5m (24.6ft) wide x 3.7m (12ft) deep. In compliance with the law the Hall has a No Smoking Policy. Should your guests go outside to smoke they are requested to be quiet and not disturb the neighbours. Cigarette butts and alike are to be placed in the receptacles provided on the wall. They are not to be thrown on the ground or in the planters for others to clear up. Alcoholic drinks are not to be taken outside of the Main Hall. A first aid box and eye wash station is located in the kitchen along with the Hall’s health and safety file. The main heating thermostat is located in the main hall to the left of the kitchen door. This will be set for at least 18°C for your hire period. If you want it to be particularly warm or cooler during your hire period there are instructions on how to make the necessary adjustments. Generally the heating is timed to turn off at 11.50pm. It is the responsibility of the hirer to check that the heaters in the kitchen and bar area are turned off at the end of their hire, irrespective if a bar is booked. The switches for the Main Hall’s fluorescent lights are located adjacent to the swing doors. Above these switches is a dimmer switch to control the wall lights. The lighting and ventilation fans in the toilets are automatic, switching on upon entry to the room and off after a preset time. Air and water heaters are provided for the toilets which may be used at the hirer’s discretion. Switches for these are fitted adjacent to the Gents toilet door, along with instructions as to their use. If used the heaters are to be switched off after use and before vacating the hall after the hire. There are baby nappy changing facilities in the toilet for the Disabled. Please follow the instructions which can be found inside the unit. Used nappies are not to be deposited in the Hall’s refuse bin but are to be taken home for disposal. It is illegal for us to dispose of the them through our normal refuse collection service. There are electrical power socket circuits fitted by the stage, protected by a residual current device (earth leakage circuit breaker) which are for use by discos, bands and alike. These are timed to turn off automatically at 11.30pm. Please warn your guests, band or disco of this. Additional electrical power sockets are fitted for use by stage production companies and alike for shows and plays. These are normally switched off and are not for use by general hirers. Requests for their use will be considered by the Committee. Hot water urns, electric kettles, cookers and a microwave are provided for use by the hirer, along with, where considered necessary, instructions as to their safe use. If used, the equipment is to be emptied, switched off and wiped clean after use and before vacating the Hall after the hire. Care should be taken when using the hot water urns and kettles in case of scalding. No attempt should be made to move the water urn(s) when they are in use or contain hot water. Spillages should be dealt with as soon as possible. Sharp knives and glassware are not to be taken into the Main Hall. There are 20 rectangular folding tables and two square tables for use by the hirer. Should additional tables be needed for laying out a buffet etc., there are four table tops with trestle legs available on request. The tables are not to be overloaded. Two storage trolleys are provided to move the folding tables around and to safely stack them after use. Tools are provided to correctly fold the tables after use. Please follow the instructions given in the table storage area and on the trolleys. The tables are to be cleaned after use and any permanent marking or damage reported to the Clerk. Do not drag the tables along the floor as this causes damage to both the tables and the polished floor. There are 150 padded chairs for use by the hirer. A trolley is provided to move them and safely stack them after use. Where necessary, chairs are to be cleaned after use and any permanent marking or damage reported to the Clerk to the Council. Do not drag the chairs along the floor as this causes damage to both the chairs and the polished floor. The chairs are not to be stacked more than 10 high. There is a small selection of chairs and tables for use by pre-school children up to infants. The tables may be used for (adult) ’coffee’ tables if so wished. There are four upholstered chairs with arms, available upon request, for use by the elderly and/or infirmed who are unable to use the normal chairs. The Hall has 12 green baise covered square games (card) tables, available for use upon request, along with spill proof table cloths in the event of the tables being used for refeshments. There are professional white catering cups, saucers and two sizes of side plates, as detailed below and stainless steel knives, forks and spoons available for hire at a cost of £10, should the hirers wish to provide their own buffet or purchase one from a local supplier, such as “Sainsbury’s” and alike. There are 96 each white porcelain cups and saucers and 108 each white porcelain 61/2” & 9“ plates along with stainless steel cutlery. The crockery and cutlery is to be washed clean, dried and put back into the storage boxes/containers after use. Damages and losses are to be reported to the Clerk to the Council and paid for at the rate of £1.00 an item. There are number of unmatched sets of cups, saucers and side plates available in the lower cupboards in the kitchen available for free use by hirer. No glass drinking glasses are to be brought to the hall as they cause a hazard should they be broken. Clear plastic glasses are readily available to hire/purchase and are an adequate substitute. Chairs, tables and other items are not to be dragged along the floor as this causes damage to both the chairs and the polished floor. Any spillages are to be cleaned up immediately using paper towels and/or a damp mop. Water only should be used for cleaning the floor of any spillages. Any serious spiilages, markings or damage are to be reported to the Clerk. Extreme care is to be taken with party poppers, confetti cannons and alike which eject coloured crepe paper. If this crepe paper becomes wet it can irreparably stain and damage the polished floor. Any such severe damage to the floor requiring remedial work will be charged for. Should the hirer wish to bring such equipment to the hall it will be their sole responsibility to see that it is adequately and safely supervised. It will also be the hirer’s responsibility to ensure that the supplier of the equipment has public liability insurance in place in the event of accidents. The Community Hall Committee accepts no responsibility in this regard. Decorations are not to be affixed to any part of the structure of the Hall using drawing or press pins and/or adhesive tape of any type. They are not to be affixed by any means to any part of the ceiling and its fittings or near heaters. Two catenary wires are provided for the purpose of affixing decorations and/or notices. Decorations and/or notices are to be removed after use along with their fixings. The ladders stored in the storage room off the main hall are for maintenance use by the Committee or its servants. The Committee cannot be held responsible for any accident or incident that occurs should they by used by others for any reason. The road leading to the Hall is a public road and must not be obstructed. The Hall car park has restricted car parking so please reserve these spaces for the disabled. Parking is available in several adjoining streets but please park sensibly to avoid annoying the local residents. When arriving and leaving please be quiet and not shout, sound your car horns, accelerate away fast screeching your tyres or have your car audio systems loud. A public address system and hearing loop is available for use upon request. Please keep the windows and doors closed when noisy events are taking place in the hall and also please ask your guests to leave quietly at the close of your event. Car doors banging and loud talk in the car park are disturbing to local residents. Non compliance with this request may result in us losing our Premises Licence. Please leave the Community Hall clean and tidy and take your rubbish home. Cleaning equipment can be found in the storage room off from the Main Hall and in cupboard No.4. Dust and debris is to be put in the wheelie bin provided in the kitchen NOT left on the floor in the storage room. Please report any faults or damage to the Clerk to the Council as soon as possible so that they can be rectified quickly. 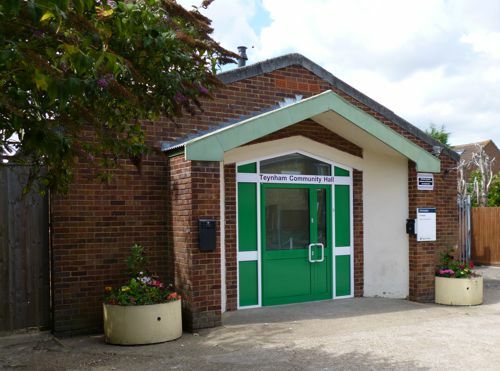 The Committee welcomes any written comments about your hire of the Community Hall. A book for these is provided in the kitchen. In the event of a fire, the Hall should be evacuated in an orderly manner using the appropriate exits, and the Fire Brigade called by dialling 999. Instructions are given in 28. below and are also posted at the hall, detailing the information to be given to the emergency services. The nearest public telephone is located at Teynham Railway Station [see also 27]. The exact location of the nearest telephone, fire exits and fire extinguishers must be noted before the commencement of the function and the manner of opening fire doors should be made known to your guests. The fire doors are opened by pushing on the crash bars. 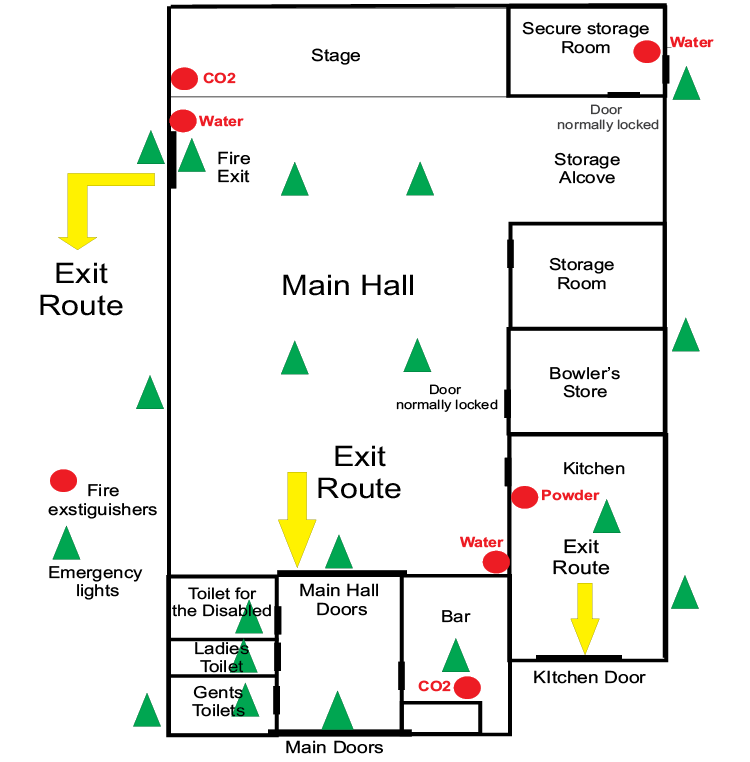 A sketch plan showing the fire exits and the location of the fire extinguishers is shown in Figure 1. As the Hall does not have a telephone and the nearest public one is located at Teynham Railway Station, you are advised to bring a fully charged mobile telephone for use in case of emergency. The nearest public telephone is at Teynham Railway Station or use a mobile phone. 89 Station Road, Teynham, ME9 9DU. Do not put down the hand set or ring off until the emergency services have correctly repeated the above address back to you. Attendants should ensure that once the hall has been evacuated, members of the public do not re-enter the building to collect personal belongings, etc. On the arrival of the Fire Brigade, the person in charge of the hall should report to the Officer in Charge that all persons are safe, or of their last known position. Attendants should only attempt to extinguish the outbreak using the fire appliances provided if it is considered safe to do so. If it is considered safe to attempt to extinguish the outbreak of a fire using the fire extinguishers, instructions on their use are contained on the notice adjacent to the respective fire extinguisher. The locations of the fire extinguishers are shown in Figure 1.